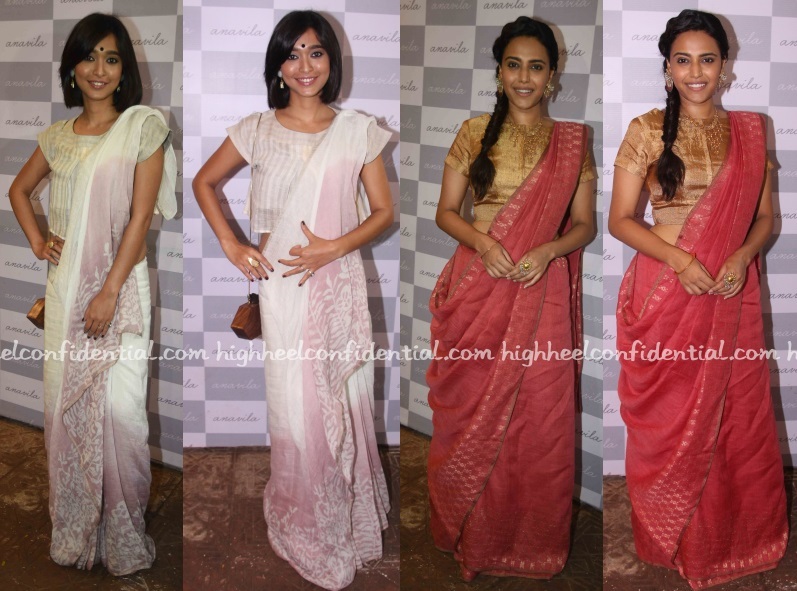 Wearing their Anavila sari draped in a style different than the Nivi , Sayani and Swara attended the designer’s store launch on Friday. The both looked cute. P.S. Swara is wearing hers in a Bengali Atpoure style but without continuing the drape over the other shoulder. Am all for experimental saree drapes, but not if their wearers can’t carry them off. These drapes look just… weird. No sayani , no .. Do not venture into the kiran rao/tillotama/frumpy -wanna be quirky-nerd category…… You are too suave for that … And thank you for loosing that god forsaken oxblood lipstick . Both look silly. Swara is always trying hard. Lol with hardly any sucess. Big bindi does not suit everyone, Sayani looks bad with it.